Greenpeace claimed victory over Shell this morning after the company announced it would end all Arctic exploration "for the foreseeable future". Shell said this morning that it had stopped exploration in the Chukchi Sea off the coast of Alaska after it did not find sufficient quantities of oil and gas to continue exploration. It said the results of its exploration were "disappointing" and that it expected the bill for its activities to exceed $3bn (£2bn), including contractual commitments. Marvin Odum, director of Shell Upstream Americas, said: "The Shell Alaska team has operated safely and exceptionally well in every aspect of this year's exploration programme. Shell continues to see important exploration potential in the basin, and the area is likely to ultimately be of strategic importance to Alaska and the US. However, this is a clearly disappointing exploration outcome for this part of the basin." Shell’s forays into the Arctic have been fiercely opposed by environmental campaign groups, including Greenpeace, which claim that extracting fossil fuels will further destabilise the climate. 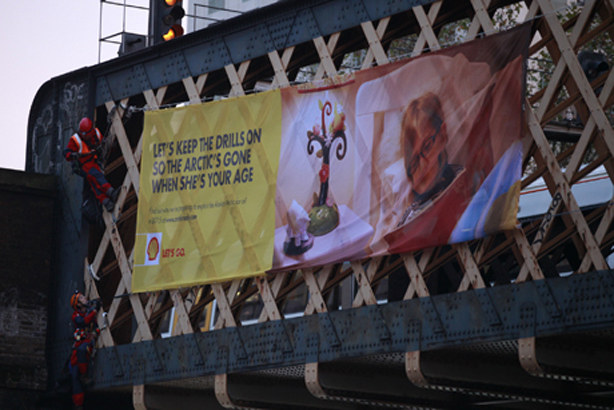 Greenpeace campaigners were in high spirits on Monday and claimed victory over Shell. John Sauven, Greenpeace UK executive director, said: "Big oil has sustained an unmitigated defeat. It had a budget of billions, we had a movement of millions. The ‘unpredictable regulatory environment’ that forced Shell out of the Arctic is otherwise known as massive pressure from more than seven million people. For three years we faced it down, and the people won. The Save the Arctic movement has exacted a huge reputational price from Shell for its Arctic drilling programme. And as the company went another year without striking oil, that price finally became too high. It is pulling out." The news came as more than 180 artists and art organisations signed a pledge that they would never take sponsorship money from oil companies, and urged others to do the same.